We have teamed up with some wonderful bloggers to bring you yet another great giveaway! 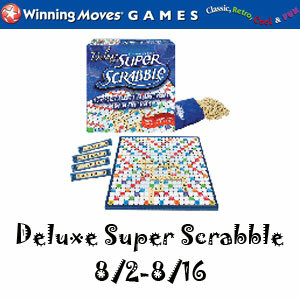 This giveaway is for one of our family favorites, Deluxe Super Scrabble Game! Now is a good time to WIN some Christmas gifts! Be sure to check out all of the giveaways we have on our Giveaway page! We have quite a few more great giveaways coming between now and Christmas so please subscribe by entering your email in the sidebar on the right so you won’t miss anything! You can also follow my Giveaway Board on Pinterest here where I share giveaways by lot’s of my blogger buddies. Contents: 441 space Tile-lock Gameboard, 200 plastic letter tiles, 4 plastic tile racks, drawstring tile storage bag and illustrated instructions. I have played many hours of the board game clue.